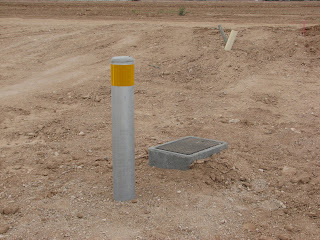 Concrete Filled Pipe Bollards - Moyers Contracting, Inc. 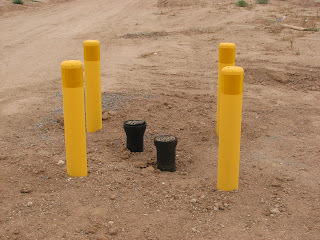 Concrete filled pipe bollards also known as steel pipe bollards are used for many applications (these are different than concrete bollards). In the parking lot maintenance industry, they are used almost exclusively for protection. They can protect walls, handicap signs, gas tanks, propane tanks, water valves, and ATM machines. We have installed them for all of these applications. We can also do plastic bollard covers. 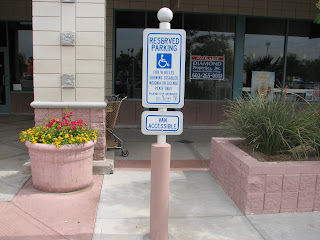 Many times we will put a sign post in the bollard to protect the sign; mostly a handicap sign, from getting run over or damaged. Once a bollard is put in, there are some finishing steps to complete. These steps are some of the reasons why we think we stand out from others. The pipe must be installed deep enough (3′) and enough concrete must be used to keep the pipe solid for years if not decades. To finish a pipe bollard it has to be filled with concrete and neatly and cleanly rounded off. The concrete at the base (if it is installed in an existing concrete slab) must be neatly finished. The pipe has to be painted safety yellow and there can be no overspray on the existing surface.